Being an elder, a leader, a pastor; it's a privilege, a joy, and a challenge. Every Christian should be leading or learning to lead someone... but it's not something to be tackled alone. That's why we publish books, articles and resources to help Christians grow and grow others—like The Vine Project, Wisdom in Leadership, and The Thing Is. 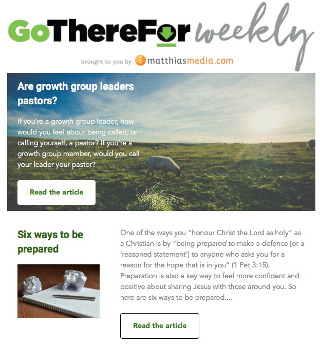 Let us encourage you with our weekly email of articles, ideas and useful books and courses that you can use in your life and ministry. We'll also send you a free ebook, The Thing Is, which you can use in your ministry to help other Christians fulfil their God-given purpose. An opportunity to discover the life-changing purpose that God has for each one of us. Not some vague-Christian-cliché purpose, but a purpose that is clear and real enough to drive the decisions we make and the way we live our lives from this point on.